DVD Synopsis: What matters most in life, eh? Hockey, donuts and beer? A slab of back bacon? And did we mention beer? At least, that's what matters most to Doug (Dave Thomas) and Bob McKenzie (Rick Moranis) when they bring the goofy lunacy of SCTV's The Great White North to the great wide movie indoors. (Co-writing and directing as well as starring. Whew!) Strange, it is. And Brew, it is, what with our ski-capped hoser heroes upending the mind-controlling scheme of a diabolical brewmeister (Max von Sydow). Beauty, eh! We all have our guilty pleasures. Well, when it comes to movies, I have a lot of 'em, dozens and dozens in fact, that I enjoy watching but simply cannot defend. Yes, they're corny, or sloppy, or just plain bad, but damned if I don't watch them anyway. 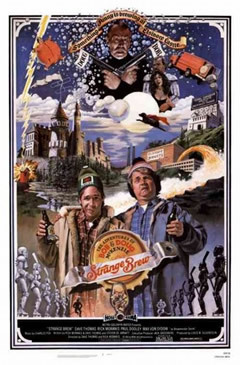 1983's Strange Brew is a perfect example. I first saw this movie on cable less than a year after its theatrical run, and I couldn't get enough of it. Now, I'm older, and should know better, but what can I say? The love is still there! Based on characters that first appeared on television (in the hugely underrated SCTV), Strange Brew follows the exploits of Bob (Rick Moranis) and Doug McKenzie (Dave Thomas), two brothers who love beer almost as much as they love goofing off. After a failed movie premiere deprives them of their precious beer money, the brothers scheme to get a free case from Elsinore Breweries, and instead wind up as the company's newest employees. What they don't know is that an evil brewmeister (Max Von Sydow) and his hapless sidekick (Paul Dooley) are working on a drug that, when consumed, will turn ordinary people into mindless zombies, ones that can easily be manipulated to do their bidding. The fate of the world hangs in the balance, and it's up to the McKenzie brothers to save the day. Okay, if that synopsis doesn't sell you on this film's sophomoric qualities, then there are plenty of scenes to convince you. In order to test their mind drug, the baddies stage hockey games that pit patients from the neighboring psychiatric institution against one another. These patients, who are already on the drug (the brewmeister, it turns out, is also the head of the institution), make their way through a tunnel that connects the institute to the brewery, where they suit up and play on the brewery's skating rink! There's even a scene where Bob and Doug are the goalies, and get repeatedly pummeled by the zombie-like patients (they never really explain how the brothers got into the game, but there you go). And yet I can watch Strange Brew every single time it's on. I'm sure the chief reason I keep coming back is a bad case of nostalgia; my brother and I would watch Strange Brew over and over again with our friends. Yet there must be something more to it than that. Perhaps it comes down to the likability of the main characters. Bob and Doug McKenzie, as played by Moranis and Thomas, can be genuinely funny, even when placed in the most cinematically ridiculous situations (the entire opening sequence, when they're premiering a new Sci-Fi film, is pure gold). Well, regardless of why I love it, the fact remains I do, and probably will for many years to come. Judge me if you must, pity me if you can...I'm a Strange Brew junkie! I echo your sentiments. I can't tell you how many times used "hoser" after seeing this. BTW - didn't Mel Blanc voice their father? i find myself in the exact same boat. this film is about the only one i'm aware of to match the place that 'heavyweights' holds in my heart. just found the site and really enjoy it. look forward to following the journey from here on. Thanks to everyone for stopping by. @Pat: Another gem! Thanks so much for posting it. @Fred: Yeah..."Hosers" and "Knobs"! And yes, you're correct: the father was voiced by the late, great Mel Blanc. @musdestroyalltraces: Yeah, there's just something about this movie that works for me, even though I can CLEARLY recognize all it's faults (and I'm glad to have you along for the ride! Thanks so much for the kind words).